Guided Snowshoe Tours in New Mexico's Pristine Wilderness! Join Taos Snowshoe Adventures for an unforgettable winter journey into New Mexico's Southern Rocky Mountains, near Taos and Santa Fe. Try out a pair of today's lightweight aluminum snowshoes, and you'll see why snowshoeing is one of the most popular winter recreational activities in the world! Snowshoeing is an economical, eco-friendly way to get outdoors and explore the beauty and solitude of the New Mexico wilderness in winter. 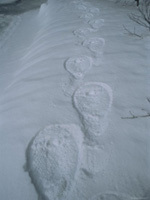 Snowshoeing does not require any technical ability, years of training, or expensive gear and lift tickets. Snowshoes offer both the beginner and the experienced an opportunity for world class outdoor winter recreation in the Taos and Santa Fe areas. Our experienced naturalist guides add to the experience, with a broad knowledge of local ecology, natural history, and wilderness skills! Taos Snowshoe Adventures offers Half Day Snowshoe Trips, Full Day Backcountry Snowshoe Tours, Full Moon Snowshoe Hikes, and Overnight Yurt Trips, in New Mexico's pristine winter wilderness, near Taos and Santa Fe. We also offer a "Learn to Snowshoe!" Hike, for a short family excursion, or just a quick jaunt in the forest, to enjoy the solace of the Sangre de Cristo Mountains in winter. All of our Guided Snowshoe Tours are custom designed, to meet the needs of the group. Winter recreation at high altitude is hard work, so the pace on most of our snowshoe trips is easy and relaxed, with an emphasis on enjoyment and education. Our trained and certified mountain guides, take every precaution to ensure a safe and enjoyable experience for all. 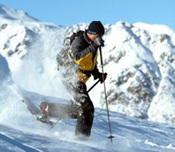 Join Taos Snowshoe Adventures for the New Mexico winter wilderness adventure of a lifetime! with any questions, or to make your reservations. Permits issued by the Carson and Santa Fe National Forests. Copyright © 2008-2018-2008-2018, Taos Snowshoe Adventures. All Rights Reserved.